Small and portable design, you can take anywhere. Play anytime. Easy to Store, Easy to Transport, Easy to Play. 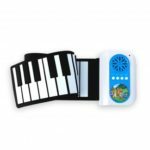 It is suitable for children beginners, kids, family fun, music enthusiast, professional players, or people on the go. 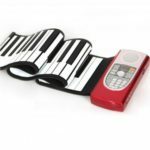 Portable roll up piano, convenient storage and easy carrying. 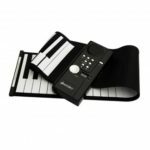 The keyboard is made of environment friendly silicone, non-toxic and tasteless. Features 21 demo songs, 128 kinds of rhythms, 140 kinds of tones. 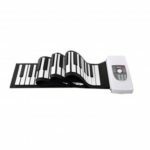 Supports recording, programming, playback, tutorial, sustain and vibrato functions. With LED display showing the relevant parameter information. With built-in speaker and headphone jack for connecting earphone or external speaker. 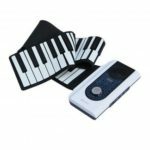 With USB MIDI output and sustain pedal interfaces. Li-ion Battery or DC 6 V power adapter, output power: 500MW.